See the index for Korean Language Series here. Please read the previous series before reading this post, because the Korean is writing the series with the assumption that you already know what the Korean provided previously. WARNING: You should be able to see typed Korean language in order to fully read this post. If you are a Windows user, you can go to Microsoft's website and download the "East Asian Language Support". Ask your local computer nerd; entice him with a woman and it will be easy. If you are a Mac user, enjoy your cute commercials. MORE WARNING: The Korean never received formal education as to how to teach Korean to non-Korean speakers. Therefore, all the technical terminology that the Korean uses in this post (as well as in other Korean Language Series) are made up by the Korean. Additionally, the Korean will often be wrong about things. But hey, that’s the price you pay if you try to learn a foreign language from an amateur off a blog. I saw in your earlier posts that you had given a quick overview of the Korean language, however I didn't see any posts about the Korean number system. I know that there are two ways to count in Korean, Sino-Korean and, I guess you'd call it pure Korean, but how do you know when to use which? Also, how do you tell time in Korean with these two number systems? If I am going to learn Korean, should I learn native Korean or Sino-Korean? Let us answer Jamie’s question first, because it touches upon an important concept in Korean language. Since Korea spent its entire history next to China, a giant of world culture, much of Korean culture – including language – has elements of Chinese influence. This was much more true in the old days (up to 18th century or so,) when the educated class of Korea wrote in Chinese although they spoke in Korean. This influence survives in Korean language today as Sino-Korean vocabularies, which is just a fancy term that means “Korean words that originated from Chinese.” Currently, around 60 percent of Korean vocabularies are Sino-Korean. The existence of Sino-Korean vocabularies makes it seem like knowing Chinese would be helpful toward learning Korean. That could be true, but the actual use of Sino-Korean words in Korean actually may lead to confuse Chinese speakers. There are at least two possible points of confusion. Second, while Sino-Korean words can be expressed in Chinese, the two languages may differ in their uses of the Chinese characters because the two languages evolved separately. For example, 酒 in Chinese means “wine”, and 店 means “store”. Put together, Koreans understand 酒店 (written and pronounced as 주점 in Korean) as meaning “bar”. But Chinese understand 酒店 (pronounced as “jiu dian” in Mandarin) as meaning “hotel”. Sometimes, this divergence between Chinese and Sino-Korean happened because Koreans came to adopt a Sino-Japanese word and pronounce the word in Korean. For example, the word for an automobile is 自動車 in Sino-Japanese (“jidousha,” or “self-moving cart”) and 汽車 in Chinese (“qi-che” or “steam-cart”). Koreans ended up adopting 自動車, but pronounce the word as 자동차 (“ja-dong-cha”) because that’s how Koreans pronounced those three Chinese characters. 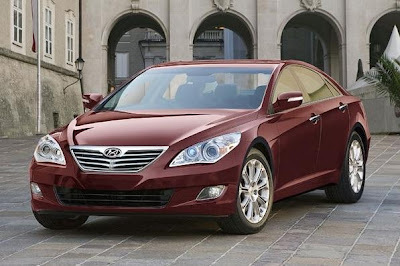 The new Hyundai Sonata, a 자동차 that is poised to take the 2010-11 market by storm. Based on the chart, you can see a few patterns. Second, you may have noticed that the Korean broke down large numbers with four zeros between commas instead of three. The Korean did that for your convenience. Large numbers are broken down with three numbers because in English and most European languages, the unit “jumps” at every thousand. (For example, a “thousand thousand” is a “million”, and a “thousand million” is a “billion”.) But in Chinese and Korean, the unit jumps at every ten thousand. So for example, the unit 억 (=108) goes all the way up to 천억 (“thousand 억”, i.e. thousand 108) before it jumps to 조. In other words, 만억 (“ten thousand 억”) or 십천 (“ten thousand”) are incorrect in Korean. It's all about the 신사임당, baby. Third, notice that in the native Korean, there are two entries for numbers 1 through 4. The first one is when the number is used as a noun. The second is when the number is used as an adjective. So, for example, if someone is exercising and simply narrating “one, two, three, four” for the sake of rhythm, s/he would say “하나, 둘, 셋, 넷” and not “한, 두, 세, 네” because the numbers are nouns in that context. But if someone is talking about “two people”, s/he would say “두 사람” instead of “둘 사람”, because “two” as an adjective modifies the noun “people” in that phrase. Then the big question is – when do you use the native counting system versus the Sino-Korean counting system? But before we can get to that, we have to address another concept in Korean that is crucially related to numbers – “counters”. More about counters, how to count in Korean, how to tell time in Korean and advanced materials, after the jump. The tricky part about counters is that there are different counters for different types of nouns. For example, majority of objects use 개, like 사과 한 개 (“one apple”). But for long objects with a handle, the correct counter is 자루, like 칼 세 자루 (“three knives”). Another tricky one is 마리 versus 명. 마리 is used with animals, like 강아지 네 마리 (“four puppies”). 명 is used with people, like 의사 두 명 (“two doctors”). You absolutely do NOT want to use 마리 to describe a person, because it implies that the person is an animal. That much is enough for this part. For the full list of counters, please see the “Advanced Stuff” section below. Now we are actually ready to count in Korean. There are four ways to count in Korean. Literal translation: Student three came to visit. Correct translation: Three students came to visit. Literal translation: Student three persons came to visit. Literal translation – There persons of student came to visit. All four of the above are grammatically correct, although they all convey slightly different nuances. (b) is the most colloquial and has nearly no restrictions. (d) is the most literal and used nearly exclusively in written texts. (c) somewhat implies that we know the three students previously, and only certain types of nouns are used in (c) (For example, it is fine to say 두 학교 (“two schools”), but ungrammatical to say 세 나무 (“three trees”)). (a) and (c) cannot be used with nouns that cannot be counted, since neither construction has a counter involved. Notice the variant uses between 셋 and 세, depending on whether “three” specifically modifies a noun in the sentence. (1) Sino-Korean is used with large numbers. You may notice that the native Korean words for hundred and above are rarely used. In fact, it is likely that an average Korean would not even know the native Korean term for hundred, thousand, etc. In practice, native Korean tends to be used for numbers less than 30, and Sino-Korean tends to be used for numbers greater than 30. A big exception to this, however, is when counting ages, in which case native Korean counting system is used about as frequently as Sino-Korean. (2) Only Sino-Korean is used in math formulas. 1 + 3 = 4 is read as 일 더하기 삼은 사, not 하나 더하기 셋은 넷. (3) Only native Korean number is used when there is no counter. This means that the constructs (a) and (c) above can only be made with native Korean numbers. (4) Certain counters only match with native Korean, other counters only match with Sino-Korean, and still other counters match with both. This is detailed in the Advanced Stuff below. These rules are not ironclad, and people often change them arbitrarily in a colloquial setting. The best way to memorize them is simply to see a lot of different sentences, and memorize the entire context, not just the rules. Finally! We get to the part about how to tell time in Korean. Like most other “things” in Korean, time is measured by counters – 시 for “hour”, 분 for “minute” and 초 for “second”. The Korean mentioned earlier that each counter matches up differently, either with native Korean numbers, Sino-Korean numbers, or both. With these three counters, 시 matches up only with native Korean numbers, while 분 and 초 match up only with Sino-Korean numbers. Also, Korea uses American style time, not European style time. In other words, 1:30 in the afternoon is not 13:30. Now, let’s tell some time. If a digital clock displays “3:22:08”, how do you read that in Korean? Remember which counters to use, and which number system to use – native or Sino. Recall that hour is native, minute and second Sino. So “3:22:08” reads as: 세 시 이십이 분 팔 초. What if the clock displays: "11:34 p.m."? "a.m." and "p.m." in Korean are translated into one of the time-related words above. So "11:34 p.m." reads as either 저녁 열한 시 삼십사 분 or 밤 열한 시 삼십사 분. Be aware that while English-speakers might read "2:13 a.m." as "two-thirteen in the morning", Koreans would read it as 새벽 두 시 십삼 분, not 아침 두 시 십삼 분. For Koreans, 아침 does not start until the sun rises. What if you wanted to talk about duration, not the exact moment? For example, how would you say "I will visit two hours and thirty-two minutes later"? In that case, only the "hour" counter changes from 시 to 시간. So the equivalent translation is: "두 시간 삼십이 분 후에 오겠습니다." 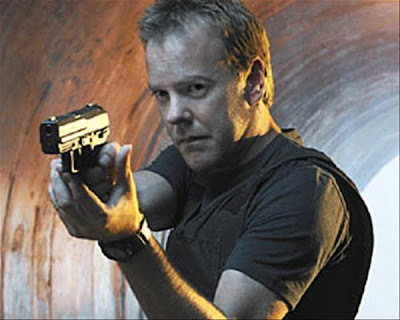 Hurry, Jack Bauer! There is only 이십이 시간 십삼 분 사십구 초 left! A couple of useful expressions to close. 정각 is used to say "exactly on the hour." So if you wanted to say, "Let's meet at 1 o'clock", you would say in Korean: 한 시에 만납시다. But if you wanted to say, "Let's meet exactly at 1 o'clock", you would say in Korean: 한 시 정각에 만납시다. 전 is used to say "until" within the context of time-telling. So if you wanted to say, "It is 5 minutes until 12 o'clock", you would say in Korean: "12시 5분 전입니다." - How to form ordinal numbers: For native Korean, add 째 at the end. So it goes 둘째, 셋째, 넷째 (second, third, fourth...) Note that "first" is irregular; it is 첫째, not 하나째. Also note that unlike English, ordinal numbers in Korean are both adjective and noun. (In English, ordinal numbers are adjective only.) So for example, it is fully grammatical to say 우리 둘째는 참 착해. ("Our second [child] is very kind."). For Sino-Korean, ordinal number is formed by adding 제 in front. So it goes: 제일, 제이, 제삼... Fortunately, there is no irregularity here. For example, it is very common to see a church named 제일 교회, which means "First Church". - No plural nouns in Korean: It is notable that in Korean, there is no plural noun because nouns are never conjugated in Korean. (See the earlier series on particles for an explanation.) The auxiliary particle (which is not yet covered) 들 can be attached to a noun to signify a plural, but it is perfectly grammatical not to include 들. For example, 세 학생들이 찾아왔다 and 세 학생이 찾아왔다 are both grammatically correct. - List of all counters: Here is a list of counters the Korean can think of, associated with their use and their match with native or Sino-Korean numbers. Recall that generally, numbers over 30 are expressed in Sino-Korean numbers regardless of the specific match. In other words, the "matches" only apply to the numbers under 30. Also, please note that some counters act differently when used with cardinal versus ordinal numbers. Because the Korean is not being paid to do this, he mostly included the counters that cannot stand alone in this chart. Keep in mind that, in addition to the counters in this chart, pretty much any noun signifying a container/vessel can serve as a counter. So for example, 가마니("sack"), 통 ("container"), 접시 ("plate"), 상자 ("box"), etc., can all serve as both stand-alone nouns and counters. The Korean guarantees he missed some, because there are tons of counters in Korean. Don't get snarky. - Irregular number-adjectives: Earlier in the post, the Korean mentioned that one, two, three, four have different forms for noun and adjective in Korean. Rarely, there are some counters that require irregular adjective forms of certain numbers. For example, for the counter 되 (a traditional container measuring .477 gallon), "three 되" is 석 되, not 세 되. "Four 되" is "넉 되", not "네 되". Similarly, the counter 자 (a Chinese yard), "three 자" is 석 자, and "four 자" is 넉 자. For the counter 말 (= 10 되), "three 말" is 서 말, not 세 말. While these irregular forms are maddening, the good news is that they are generally associated with very traditional counters. Those counters are not often used in modern Korean such that regular Koreans would often get them wrong. - Very large numbers: While the Korean stopped at 경, there are more Sino-Korean terms that describe even greater numbers. These numbers sometimes make an appearance when global economy or distance in space is discussed. The Korean will start from 억, which is 108. The names for the extremely large numbers are quite interesting in their Buddhism-based origin. 항하사 means "the sand always present in the river." 불가사의 means "unimaginable". 무량대수 means "large number that has no quantity." - Swearing pun: Here is a reward for reading all the way down here. Korean word for "f-word" has the same pronunciation as 18 in Sino-Korean. Because of that, texting "1818" is one way to text "eff you" in Korea. Just one quick correction. The sino-Japanese word 自動車　is "jidousha," not "jouyousha"
Second Michael: Ji Dou Sha じ-どうしゃ [自動車]. The way I'm aware of it, Koreans borrowed the word from Japan, as is true with many words for concepts and objects from the west, that came to Korea through Japan. 빵, 버스, 라디오, 담배 and so on. The modern sino-Korean language has a heavy Japanese influence due to the colonization period. As for similarity of pronunciation between Cantonese and sino-Korean words, I observed the same thing! For example (Cantonese Numbers) Yat(1) Yi(2) Sam(3) Se(4) Oom(5) Lok(6) Chat(7) Pat(8) Gao(9) Shap(10). OR 계란(鷄卵) pronounced JiDan in Chinese but GaiDan in Cantonese. Wow, thank you AAK! You give so much good information on your blog and I really appreciate it! I lived in Costa Rica and learned Spanish quite easily, but the Korean language will not be so easy. One of my Korean history professors explained the closeness of Cantonese-Korean, but I forgot the details. Like almost all language rules, there is no particular rhyme or reason for when the two systems are used. A good rule of thumb, I think, for which one to use is that things where we can write out a number (e.g., "one" instead of 1) tend to be written in pure Korean, whereas other things are in Sino-Korean. I have had three girlfriends (not "3 girlfriends") since moving here in 1997 (not "nineteen ninety-seven") would have us writing pure Korean for the first number and Sino-Korean for the second. It's not a perfect system, but it often works. About ten years ago my future ex-fiancée and I were driving somewhere in Ch'ungchŏng when we stopped at a bridge or dam or something with a marker that was put there in the late 1960s or early 1970s. It described the thing's dimensions and costs and everything, and it was clear that an attempt in Korean to write numbers in a 000-based system (not 0000-based) was doing on. 50,000 had been written (in Hangul) as 오십천. Quite baffling. Thanks for the run-down. I feel like I have to review this every few months, and it still won't be perfect. Hate the Mac all you want..
Hangul is installed in the OS..
You just turn it on.. Doesn't bother me if the PC folks have to flirt with local PD nerds..
Michael, thanks. Correction was made. If I remember correctly, modern Cantonese is considered a relatively conservative variety of Chinese compared to modern Mandarin in that it has retained many older features of pronunciation. For example, Cantonese still has the sounds -t, -p, -k at the end of syllables whereas Mandarin has completely lost these. This means that Cantonese is a better approximation of what Chinese sounded like hundreds of years ago, which presumably was when Chinese loan words found their way to Korea. That would explain why Sino-Korean words sound similar to Cantonese. Vietnamese is another language with a large % of Chinese loan words and the Vietnamese pronunciation of them is much closer to Cantonese or even Sino-Korean than Mandarin. TK, the Sonata picture you have up is not the actual picture. It is a fan generated photoshopped picture done in like 2008. There is some interesting Korean influence on the Japanese language. Take for example Korean for ear, ki, became the Japanese verb "to hear" or kiku. Korean for mouth, ip, became the Japanese verb "to speak" or ipu. Korean for nose, ko, became the Japanese verb "to smell" or kagu. Wonderful article, nice local knowledge! I wonder if, when reading a Korean newspaper, one thousand is going to be written as 일천 or simply 천? Or does it depend on whoever wrote the newspaper article?! I suppose we have the same thing in English - "one thousand" versus "a thousand"! Minor point to add regarding telling time in Korean - in the military they use Sino-Korean numbers to express hours. So 7pm is 십구시. Assume I am in Korea and walk into a large department store are the prices posted in Korean, Sino-Korean or Western* ? Assume I am talking to someone and having some difficulty. How much education does he need to understand 3+8=11? * I know Arabic numbers and am loathe to call what we use "Arabic". I'm guessing you would need to know AT LEAST the basic 1-10 Sino-Korean numbers and Korean numbers (How it's written and pronounced). I suggest if you had to choose between the two, learn how to read it. However, the good thing is (from what I know) numerals are usually used rather than the word itself (2 rather than two), so you should be fine if you're going there just for a holiday. 저는 한국어를 1(ish)년 동안 공부했어요... 아직도 공부하고 있어요. 제가 언젠가는 유창하게 되기를 희망해요. 근데 우리 질문에 답해 주셔서 감사합니다!